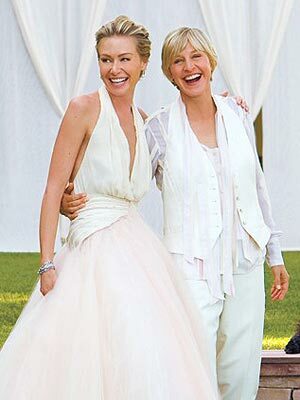 Brittany and Judy looked as if they walked out of a magazine at their wedding (including a super fab pantsuit that reminds me of this one). Their venue was the equally drool-inducing Horseshoe Bay Resort in Austin, Texas with views from the ceremony site that will blow you away. Christina Carroll Photography captured the day and couldn't help herself from getting into the joy and epic wattage smiles. Who could blame her? Now go check out the first look, matching bouquets, lakeside views, and nautical details. Want more lake views and giant smiles to brighten your day? You know there's more where this came from over at Christina Carroll Photography's blog post! What a beautiful couple! Congratulations! The dress and pantsuit are both so pretty! Wow! Both brides look absolutely amazing, I love how the outfits compliment each other without being too matchy. So much to love and admire in this wedding and two amazingly beautiful, obviously in love, ladies. Fantastic, thank you so much for posting these! Oh my goodneeeeess! Daisies, daisies, every-freakin-where!!! The centerpieces and the cake are all so beautiful. Seriously, these ladies have great taste in wedding decor. Love it all! This is straight-out-of-a-magazine beautiful. Your happiness is contagious. Congratulations! What beautiful pictures — You both have such gorgeous smiles! Also: betta fish centerpieces FTW! So cute! Looks like everyone had so much fun. The brides smiles are so big, and real. Happy for the couple. They look so happy and what a gorgeous wedding!! Just lovely. Any idea who the wedding dress designer is? It is gorgeous!! !